The application of signal processing and computer technology has opened a new era for respiratory sound measurement and analysis in the last two decades. Indeed, 30 years ago, Forgacs characterized the lung sounds as the sounds of a wet sponge and hence of very limited use. However, there has been a growing interest in respiratory acoustics as it has shown promise in the investigation of many respiratory diseases such as upper airway pathology, in particular obstructive sleep apnea or tracheal narrowing. In order to understand the respiratory sounds and their features, first we have to learn a bit of respiratory system and its anatomy and also how the sounds are being generated. The respiratory system is responsible for supplying oxygen to the blood and expelling waste gases (CO2) from the body. The upper structures of the respiratory system are combined with the sensory organs of smell and taste (in the nasal cavity and the mouth) and the digestive system (from the oral cavity to the pharynx). The larynx, or voicebox, is located at the head of the trachea, or windpipe. 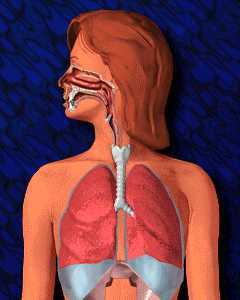 The trachea extends down to the bronchi, which branch off at the tracheal bifurcation to enter the hilus of the left or right lung. 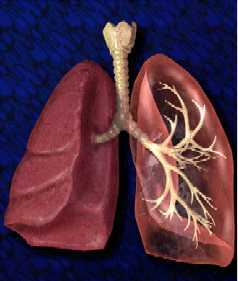 The lungs contain the narrower passageways, or bronchioles, which carry air to the functional unit of the lungs, the alveoli. There, in the thousands of tiny alveolar chambers, oxygen is transferred through the membrane of the alveolar walls to the blood cells in the capillaries within. 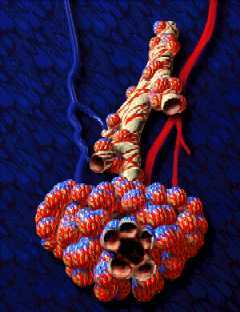 Likewise, waste gases diffuse out of the blood cells into the air in the alveoli, to be expelled upon exhalation. Physicians usually listen to the lung sounds by stethoscopes. Despite the high cost of many modern stethoscopes, these instruments only provide a limited and subjective perception of the respiratory sounds. They selectively amplify or attenuate sounds within the spectrum of clinical interest. However, recording respiratory sounds by accelerometers provide almost an ideal way to analyze the sounds. The picture below shows a typical respiratory sound recording from tracheal and lung with accelerometeres while airflow is being recorded by a face mask pneumotacograph connected to a pressure transducer. The normal breathing sound that one hears over the neck originates from turbulence of air in large central airways. Tracheal and bronchial sounds have a harsh, noisy character. Tracheal sound is strong and covers a wider frequency range than lung sound. Tracheal sound's intensity has an almost linear relationship with airflow and covers a frequency range up to 1500 Hz at normal flow rate. Tracheal sounds during inspiration are not much different from expiration and there is a distinct pause between both respiratory phases. Over the chest, breathing sounds appear more muffled. They lose much of the higher frequency components on the passage through lung and chest wall. Low frequency sound passes more readily through these tissues. In another words, they behave like a low-pass filter. Lung sounds are much louder during inspiration than expiration. 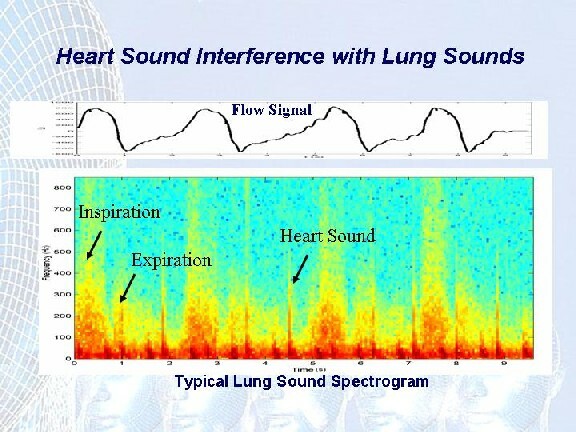 Lung sound's amplitude differs between persons and different locations on the chest surface, but primarily varies with the square of the airflow. The peak of lung sound is in frequencies below 100 Hz. The lung sound energy drops off sharply between 100-200 Hz but it can still be detected at or above 800 Hz with sensitive accelerometers. Respiratory Flow Estimation Our first project in this field was to detect the breath phases, i.e., inspiration or expiration, acoustically. Since the power spectrum of lung sounds during inspiration is much higher than that of expiration, it can be used to detect inspiratory phases. In order to detect the onsets of breaths, however, the average power of tracheal sound can be used because tracheal sound is louder than lung sounds and hence the onset of breaths can be detected from that with more accuracy. You can read the detail of this method for acoustical phase detection from here. The picture below is the output window of a program written by Joo Sim Shuah while she was working on her undergraduate thesis to enhance the breath onset detection. The graphs on the right show the lung sound spectrogram with its associated airflow on the top. The graph on the left, is the sound average power within 100-300 Hz. To read a short paper of Joo Sim's thesis project click here. To hear the lung sound shown below turn on your speakers to a high volume and click here. Continuing that line of research, the next step was to estimate the actual flow from the sounds in order to bypass the need for respiratory flow measurement, which can be bothersome when assessing young children or patients who cannot cooperate. Although one can see a clear relationship between the sounds and flow, however, the accurate and consistent estimation of flow from the sounds is not that straight forward and easy as the flow-sound relationship is not stationary and changes based on the level of flow. We tried many different signal processing, modeling techniques that can be read from our papers in flow estimation. The best results both in terms of accuracy and consistency has been achieved by using the entropy of the tracheal sounds. The paper describing the method and the results is in press in IEEE Trans. on Biomedical Engineering. 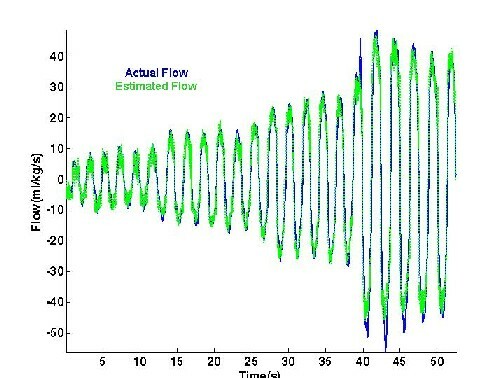 Below shows the result of flow estimation when the flow was varyign between the breaths for a typical subject. Heart Sound Cancellation Auscultation and acoustical analysis of lung sounds are primary diagnostic assessments for respiratory diseases. However, heart beating produces an intrusive quasi-periodic interference sound that masks the clinical interpretation of lung sounds over the low frequency components. The main components of the Heart Sound (HS) are in the range of 20-100 Hz, in which lung sound has major components (see figure below). Therefore, HS reduction from lung sounds without altering the main characteristic features of the lung sound has been of interest for many researchers. High Pass Filtering with an arbitrary cut-off frequency between 70-100Hz cannot be efficient in this case because lung sounds have major components in that region. Therefore, we tried different methods for both HS localization and cancellation and compared their performances. In particular, we developed methods using Wavelets, Adaptive filtering with Recursive least squares algorithm, Time-Frequency filtering and reconstruction, AR/MA Estimation in Time-Frequency Domain of Wavelet Coefficients, Independent Componenet Analysis, and Entropy based method. Among these, the best results were achieved with Adaptive filtering and time-frequency filtering and AR/MA estimation. In selection a method for HS cancellation the processing time can also be a factor. Amongh the best three methods, the Time-Frequency filtering was the fastest. The details of these methods can be found in our Recent Publication Page. 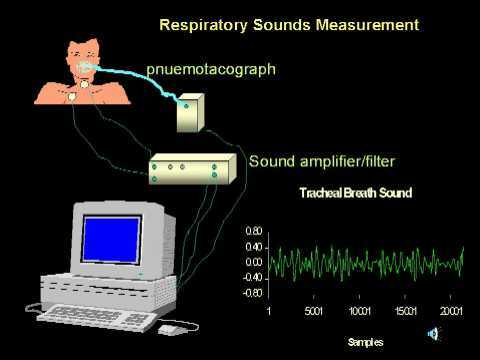 Classification and modeling of lung sounds in healthy and constricted airways Contrary to traditional pulmonary function testing (PFT), e.g., spirometry and whole-body plethysmography, the acquisition of lung sounds does not require forced respiratory maneuvers or a high degree of subject cooperation, which makes lung sound analysis attractive for use with young patients and others who cannot cooperate. Changes in lung sounds in the absence of adventitious sounds such as wheeze have shown promise as indicators of underlying airway constriction. In fact, studies have proven wheeze to be an insensitive marker for bronchial narrowing in children, making it unreliable for clinical application in PFT for airway hyper-responsiveness or asthma. Conversely, decrease in intensity of lung sounds has been found to more consistently accompany bronchial narrowing induced by methacholine challenge (MCh). Despite these findings, in order to develop a clinically acceptable method for using lung sound intensity to supplement PFT for children, more research is necessary, during both induced and spontaneous bronchoconstriction. Lung sounds acquired from eight children before and after induced bronchial narrowing via MCh have been analyzed and classified using time-domain based assessments, i.e., root-mean-square (RMS) envelope and fractals. The fractal dimension (FD) algorithms employed include the variance FD (VFD) and the Katz FD (KFD). Lung sound signal to noise ratio (SNR) was calculated using average RMS of breath hold sounds as the noise reference. The following graph shows SNR within 300-600 Hz averaged across inspiratory breaths within 85-100% of maximal flow, for pre- and post-MCh lung sounds. Results are plotted with respect to decrease in forced expiratory volume in one second (FEV1) that occurred post-MCh. A change in FEV1 (?FEV1) between pre- and post-MCh measurements that is negative and at least 10% in magnitude indicates that bronchial constriction has occurred. There were significant decreases in lung sound intensity after bronchoconstriction. If lung sounds can indeed be deterministically modeled, then geometrical and dynamical state space parameters may present useful quantities in the classification of lung sounds as they exist in healthy and diseased states. Embedding dimensions and time delay values necessary for obtaining state spaces via the Takens method of delays were determined for lung sounds acquired from healthy subjects (ages 10-26 y) breathing at low, medium and high flows, recorded over the right upper lung lobe anteriorly (RUL) and the right lower lobe posteriorly (RLL). These geometrical state space parameters were also found for lung sounds recorded pre- and post-MCh at medium flow from one male 15-year-old patient over the RLL. From state space geometry of lung sounds per inspiratory breath, Lyapunov exponents were calculated, with positive exponents providing indication of chaotic and hence deterministic dynamics. Besides the respiratory sounds, swallowing sounds are also of particular interest for physicians for detecting any swallowing disorders. The determination of respiratory phases in relation to swallowing is integral to the study of the maturity and competence of the swallowing mechanism. During acoustical monitoring of swallowing, the respiratory phases may be determined by direct measurement of airflow using a pneumotachograph, nasal cannulae connected to a pressure transducer, heated thermistor anemometry, or by indirect means, i.e., detection of chest and/or abdominal movements using respiratory inductance plethysmography (RIP), strain gauges, or magnetometers. The combined use of nasal cannulae connected to a pressure transducer in addition to measurement of respiratory inductance to follow volume changes has been recommended as the best approach in assessing respiratory and swallowing patterns. However, when studying children with neurologic impairment who have a high incidence of swallowing disorders, these techniques for assessing airflow have many disadvantages and hence there have been recent researches to remove the need for airflow measurement and estimate it from the respiratory sounds only. The human ear can easily distinguish between the swallowing sounds and breath sounds, both recorded at the trachea, as the two sounds have different characteristics. However, our ear usually cannot distinguish the respiratory phases because the characteristics of inspiration and expiration sounds recorded at trachea are very similar. The expiratory sounds recorded at trachea are slightly louder than inspiratory sounds In contrast, the breath sound intensity recorded at the chest wall during inspiration and expiration is very different. In some locations of the chest wall, only the inspiration sounds can be heard. Therefore, the respiratory sounds, recorded at the chest wall, can be used as a signature for respiratory inspiration sounds. The actual amount of airflow can also be estimated acoustically from tracheal or lung sounds. The graph below shows a typical a thin liquid swallowing sound. 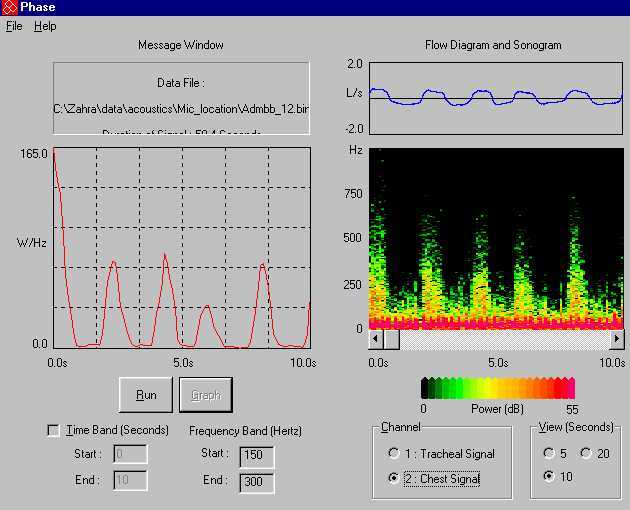 The graphs below the main graph shows the zoomed in part of the characteristic segments of the swallowing sound on the top. To hear this swallowing sound, turn on your speakers to maximum volume and click here . Swallowing dysfunction (dysphagia) is common in individuals with neurological impairment such as brain-stem stroke, head/neck injuries and spinal cord injury with anterior cervical fusion and cerebral palsy [Logemann, 1986]. When severely affected by cerebral palsy, up to 80% of individuals have some degree of dysphagia placing them at risk of aspiration. Despite the magnitude of the problem, our understanding of the mechanisms of dysphagia and its respiratory consequences remains incomplete. In order to characterize the acoustical signs of a dysphagic swallow, the normal swallow should first be studied. To date, however, there is not a well-accepted theory that explains the physiological cause of swallowing sounds, thus limiting of the characterization and diagnosis of a dysphagic swallow. Immediate and late respiratory consequences after aspiration have been identified already. Though breath sounds alter with airway caliber, such modification have not been assessed as acoustical correlation after known aspiration. We hypothesize that breath sounds after a videoradiographically documented aspiration event, represent characteristic features to be used to detect aspiration by acoustical means. Some reproducible characteristic sound patterns have been reported to be heard during auscultation swallows with a stethoscope. Although the interpretation of the heard sounds during auscultation remain subjective, they provide valuable clinical information regarding the competence of the swallow, its timing in the respiratory cycle, pharyngeal clearing of the bolus and the presence of aspiration. 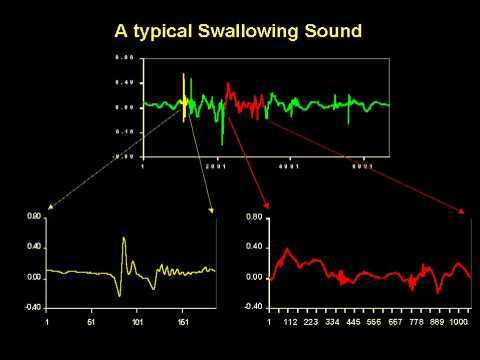 Computerized acoustical analysis of the swallow sounds has contributed to establishment of more objective criteria in the detection of swallowing disorders. It has provided insight into the mechanical and respiratory components of the swallowing cycle. However, precise correlation with physiological events and normative data has not been defined for swallow sounds to date. Once validated, acoustical analysis of breath and swallow sounds may provide a non-invasive technique to determine swallow timing within breath cycle, swallowing safety and further lead to characterize abnormalities in dysphagic swallows. Our experiments in this filed is being run in our lab and also in Respirology Acoustic Lab in collaboration with Dr. Hans Pasterkamp and Children's Hospital in collaboration with Dr. Gina Rempel.